…because I’m not renewing my domain name (honestly, I have more pressing expenses, right? ), I’m going to use my “insecure browser” (I think they mean unsecure or non-secure or even outdated…but insecure? What? It wasn’t popular in middle school and now it has a variety of self-esteem issues causing it to act out?) and start blogging over at wordpress. I’m trying to get it set up before this place disappears, so check there for me if you’re even remotely curious as to what I’m up to. In other news, last night I attempted to make cheesy broccoli chicken and rice. Sadly, I had no chicken or broccoli. The cheese was courtesy of a spare packet of mac ‘n’ cheese cheese, if that makes sense. Yeah, I think I’m getting blonder. Or having mini-strokes, which is entirely possible given the dizziness and spots before my eyes and all. Nah. Let’s just go with superblonde, okay? Pam helped me fix whatever the hell happened when I tried using the wordpress backup plugin. Apparently when I tried to use the plugin it FUBAR’d the site so that I couldn’t even get to my dashboard. And then Pam walked me through the fix. Thank you, girlfriend! You rock mightily. 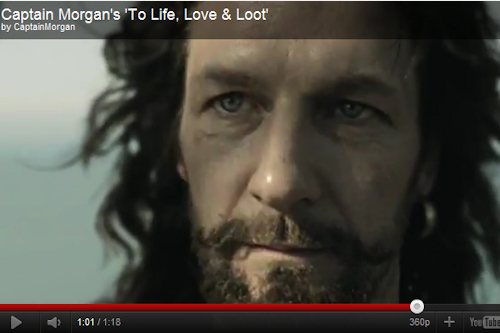 Let’s all not even bother to pretend we’re not wondering who this actor is in the new Captain Morgan commercials, m’kay? Just one of the three current Captain commercials available. Just so you know, once you’ve caffeinated…only time can put that genie back in its bottle.